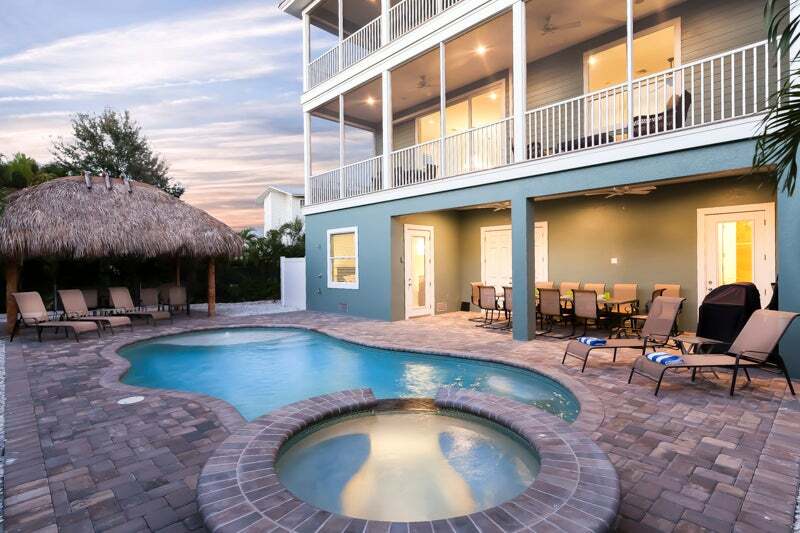 Prepare to be spoiled as the Grande Palermo sweeps you away to your ultimate vacation on Fort Myers Beach. Your private pool, spa and tiki hut are ready! Brand new construction is exclusively designed to fit any vacationing family! Check the availability of this and all our homes! We’d love to help you plan your perfect vacation with us — order your FREE VACATION GUIDE to Fort Myers Beach. Book now and get summer rate specials, including early bird specials & Florida resident specials! From the ground-level entry to your pool, just a few touches of a button set the spa rolling. 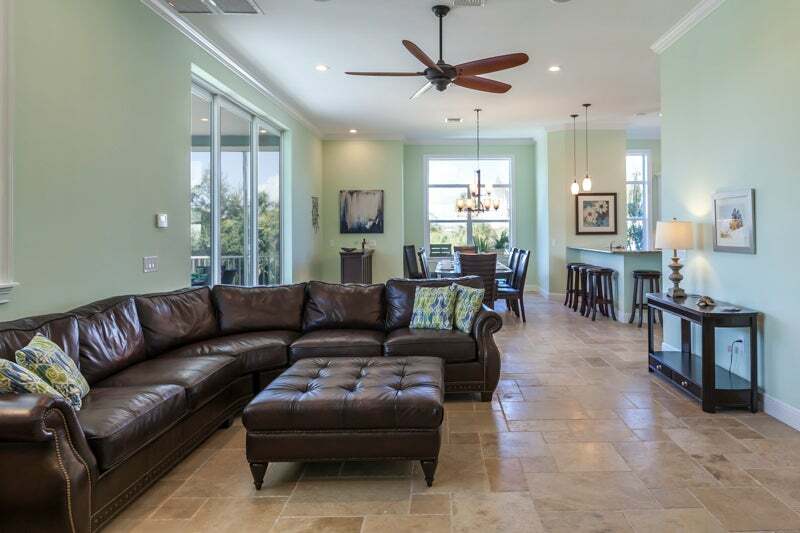 Vaulted ceilings accentuate the spacious living areas, floor-to-ceiling doors and large patios. 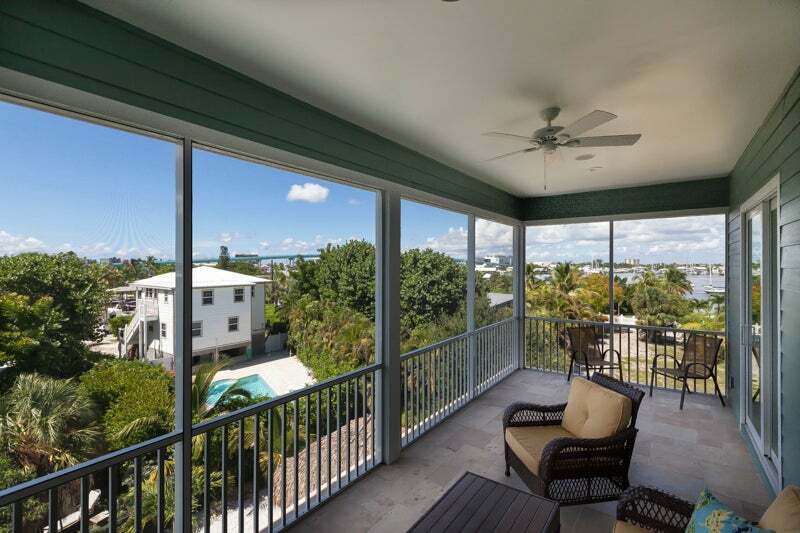 You can enjoy the panoramic views of Matanzas Pass from every window of this multi-level home. The first level includes direct access to the pool so there is no need to stray too far from the tiki hut to refresh your drink! Take the gorgeous travertine tile staircase or the elevator to the second level. Be amazed with the openness of the main entertainment level furnished with a contemporary style. 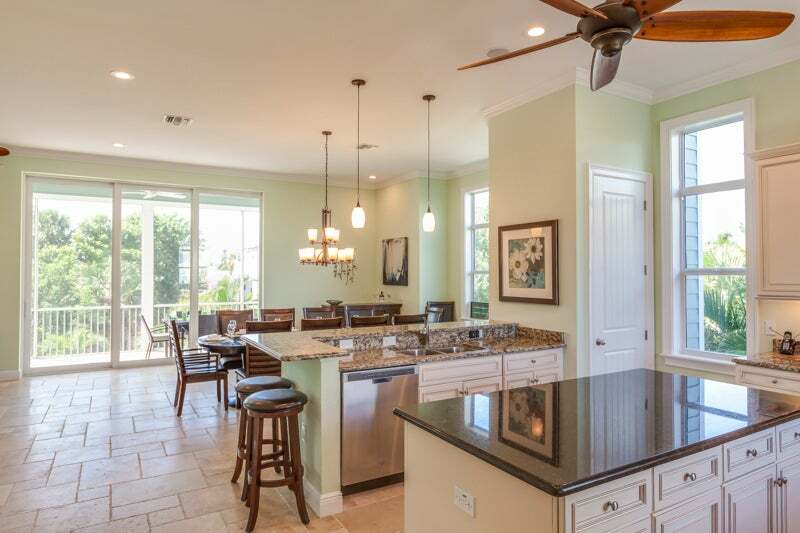 The striking kitchen, expansive granite counter tops provides a vast dining area with ample seating and sliding glass doors leading to screened deck overlooking the pool area. Located off the living area is another King bedroom with an adjacent guest bathroom. The third level is where to catch the most R&R: Two King Masters with en-suite bathrooms. Neighboring rooms include a King bedroom with access to screened deck, and an additional Twin bedroom featuring twin bunks to sleep 4. We are pet friendly — so take a short stroll to the beach access, shops, restaurants and entertainment by the Pier. Enjoy endless area activities or simply be swept away by luxury at your fingertips. We guarantee you will not want to leave. Grande Palermo is located on Palermo Circle. To help you plan your perfect vacation with us, click here to request your Fort Myers Beach vacation guide. Contact us to learn more about all our available homes — a perfect escape anytime with family and friends.